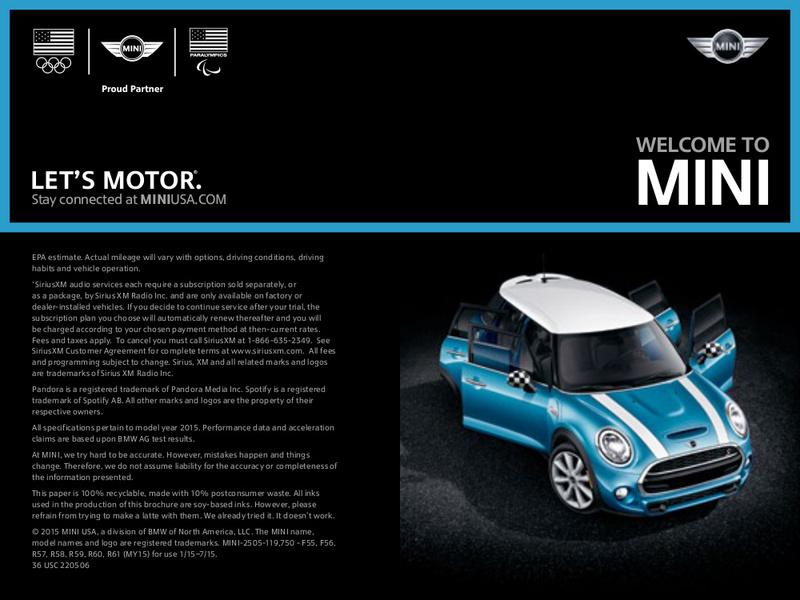 Early model year sales brochure for the 2015 Mini full-line featuring the Mini Paceman, Mini Hardtop 4 door, Mini Hardtop, Mini Convertible, Mini Countryman, Mini Roadster, and Mini Coupe. Under the hood is a 134hp 1.5L turbo 3-cylinder or a 189hp 2.0L turbo 4-cylinder for the Hardtop; 121hp 1.6L 4-cylinder or 181hp 1.6L turbo 4-cylinder for the Convertible, Coupe, Roadster, Countryman, and Paceman. Exterior colors are listed for each model at the end. Brochures are presented for research use only. Company marks, emblems, and designs are trademarks and/or service marks of Mini.